Following several lawsuits claiming that Apple’s iPhone batteries were designed to slow down over time, the company’s consumer perception hit a 19-month low, according to YouGov BrandIndex. Apple has since apologized for the slow down, but this latest drop allowed main rival Samsung to take the perception lead after their scores were neck and neck since April 2017. Samsung is the rare company to fully recover after a high-profile major crisis – something companies like GM, Volkswagen, and American Airlines have not replicated. In the course of eight months, Samsung’s consumer perception fell and then rebounded following reports that its Galaxy Note 7 batteries exploded and caused fires. The brand’s perception caught up with Apple’s on May 3, 2017. 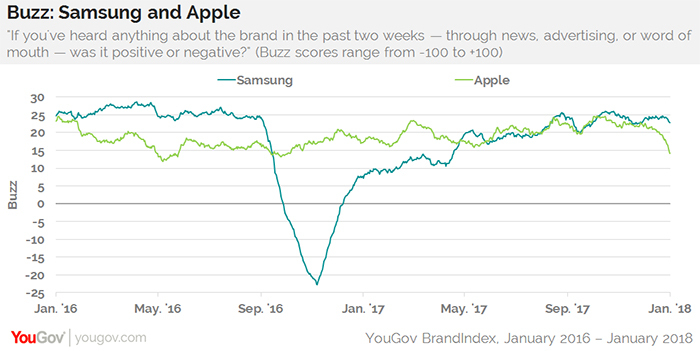 YouGov BrandIndex measured Apple and Samsung using its Buzz score, which asks respondents, "If you've heard anything about the brand in the last two weeks, through advertising, news, or word of mouth, was it positive or negative?" A score can range from -100 to 100, with a zero score equaling a neutral position.